Happy St. Patrick's Day from Rome! I hope you all had a great weekend, and maybe some festive drinks or sweets! We've traded in our green beer for Italian wine (and gelato) this year. I can't wait to share more photos once we get back, but first, we've got a few more cities to explore! Looks delicious. 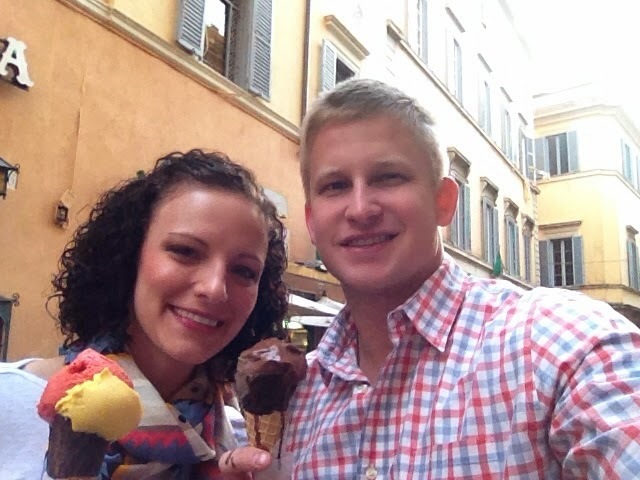 I would happily trade beer for gelato any day! Ahh I'm living (and eating) vicariously through you!!! Ciao!! One of my favorite cities in the world! Enjoy every minute! that ice cream look so tasty! love a good treat! Your pictures look awesome!!! Glad to see you're having an awesome time!! Yummm gelato! Can't wait to hear about your trip! it looks like you are having a blast! Mmmm...that gelato looks YUMMY! Enjoy your trip! Ahhh! Hope you are having a great time. Rome is amazing!